Happy Thursday! Today, I have a quick side dish for you from ‘Ohana Restaurant at the Polynesian Restaurant. We learned that ‘Ohana means family from the movie Lilo and Stitch. I have eaten at ‘Ohana once for dinner with my family, and I loved it. I look forward to going back again! Now is a great time to pick up some fresh green beans from your local farmer’s market or grocery store. Nothing beats fresh veggies! And come on, everything is better with bacon! 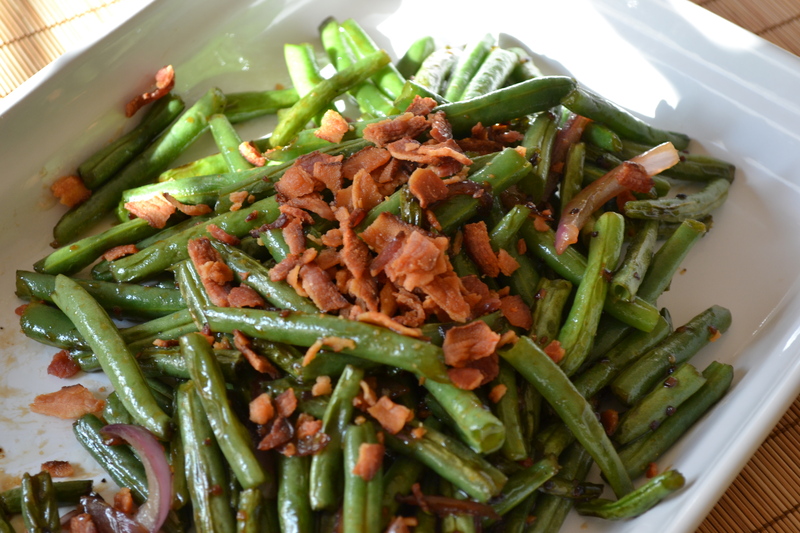 The sweetness of the stir fried onions pairs well with the saltiness of the bacon. Serve this with grilled chicken or shrimp for a Hawaiian feast at home. 1. Wash green beans in cold water; snip both ends and break in half. 2. In a medium saucepan, bring lightly salted water to a boil. Add green beans and blanch for 1 minute; strain. 3. Heat a wok or fry pan over medium-high heat. Add oil, then stir fry garlic and onions for 2 minutes. Add green beans and continue to stir fry for 2-4 minutes (depending on how well cooked you prefer your green beans). Add soy sauce, sugar, salt, and pepper and continue to stir fry for 1 more minute.